This week has provided our bird watchers an extra special treat when we were visited by a trio of American Flamingos flying over the islands here in The Dry Tortugas. One of the more beautiful and exciting species to visit the park, these Flamingos never appeared to land, but continued circling the islands for an entire day. And, what a delightful day it was. While distributed mostly around the West Indies, stragglers of this species do occasionally show up in Texas, South Florida, the Yucatan Peninsular, the Galapagos Islands, and the northern part of South America. So you can imagine our joy when these lovely creatures chose to grace us with their presence. Quite unmistakable, the American Flamingo is a tall, long-necked, long-legged, pink bird with a short, down-curved bill. Their wings have black tips and trailing edges. This species can get up to around 57 inches in length with an average weight of about six to eight pounds. Their wingspan is about 60 inches. While the males are larger than the females, their appearance otherwise is pretty much the same. Their long legs are ideal for wading in water, enabling them to stand in much deeper water than most other species. Their boomerang-shaped beak allows them to filter out water through a comb-like structure and keep the food in their mouths, which consists of vegetable matter, such as algae and diatoms, or crustaceans and mollusks. Their preferred habitat is usually around shallow coastal lagoons, lakes, and mudflats. The American Flamingo reaches sexual maturity a few years after birth and begins breeding at around six years of age. A flamingo may breed twice a year which can occur during any season depending on rainfall and its effect on food supply. As courtship begins, those interested in each other call to one another in unison. While the flamingo may mate with more than one partner, their bonding is very strong during breeding season. Their nest is made of stones, mud, feathers, and straw, and is sometimes as high as 12 inches. 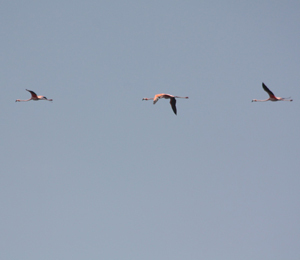 Five days after birth, the young flamingo departs the nest and begins to form groups. The youth will return to the nest, however, to feed on fluid produced by the adult's digestive system. This fluid is dribbled into the young flamingo's bill by the parent. The youngster begins searching for its own food after about two weeks. It is fun to observe this beautiful creature standing on one leg while curling the other leg under the body, something they do quite frequently. This allows the bird to conserve body heat and keep the foot warm. The Flamingo stands on one leg in both warm and cool environments with differing effects. Well, another successful week of bird watching is coming to an end. Stay tuned for more exciting birding weeks ahead.